Members of the Cascade Alliance will meet for a convening this April, 2019, in Eugene, OR. We are excited and thankful to announce that Buffalo Industries will be sponsoring us as an Event Friend and ThriftBooks will be sponsoring one of the lunches. Thank you to our sponsors for your support! SVdP’s Executive Director, Terry McDonald, was part of a panel presentation at Harvard University. Two of our members, UTEC and Greater Bridgeport Community Enterprises – The Green Team rounded out the panel. We also got to attend many of the other sessions and be inspired by the work of both for-profit and nonprofit organizations working to make their corner of the world a better place. We were equally inspired by those who attended our session on using a for-profit mindset to help meet our goals. The mix of nonprofit representatives, funders and students at our session was great. Terry was also invited to MIT that weekend to talk with students in the school’s entrepreneurship program and also those studying nonprofit management. This was highlighted in a local news story which you can read here. The objective of the study of the Cascade Alliance was to assess and exemplify the successful business model at SVdP and how it was replicated with the creation of the Cascade Alliance, their vision for the future and how they will carry out that vision. One statement within the study brings up the issue of the waste stream and how we have been using the opportunity of that to continue building upon. You can read the rest of the case study by clicking here. Our Cascade Alliance director, Susan Palmer and Chris Pletcher, the deputy director from Finger Lakes Reuse, visited our members over at the Scrap Exchange in Durham, NC during December. Chris was able to help the store develop a square footage plan and the Scrap staff had a chance to ask questions and learn from him. Chris also stayed a few extra days to learn from Scrap Staff about creative reuse. It’s great to see collaboration enabling our members to learn from each other, lead workshops and share data. 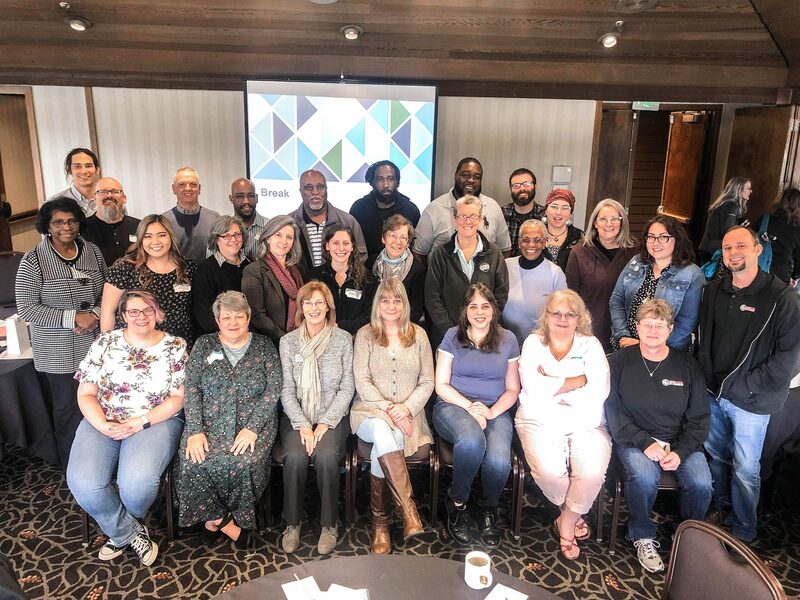 Multiple Cascade Alliance members flocked to Eugene in November 2018 to participate in training. Representatives from groups such as TAP into Hope and Opportunity House were welcomed to Eugene with site visits to the shelters, stores, donation centers and much more that St. Vincent de Paul Society of Lane County runs. They were able to work alongside some of our staff in the online book department and other areas to learn about certain operations and bring that information back to their organization. We are proud to announce that we are new sustaining members of the Product Stewardship Institute! PSI works to develop and promote legislation and voluntary initiatives whereby manufacturers are responsible for recycling or safely disposing of their products once consumers are done with them. We’re looking forward to sharing what we know about mattress stewardship and learning what they know about the greater universe of extended producer responsibility strategies. On October 18-20, 2018, professionals in waste management, environmental professionals, city officials and more will gather at the ReuseConex Conference in Cincinnati, OH. 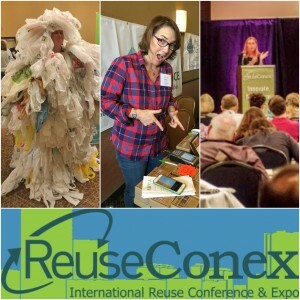 ReuseConex is the signature event of Reuse International, a nonprofit organization dedicated to increasing awareness of reuse – a central tenant of sustainability – through educational events, training services and research projects. Two of our own, Terry McDonald and Susan Palmer will be among the speakers at the conference. Terry will be speaking on Friday, the 19th about Textile Diversion: A Counterpoint to Fast Fashion. He’ll be part of a panel of speakers. Susan is speaking during the lunch on Thursday about Using Strategic Partnerships to Increase Reuse. Along with Susan and Terry representing Cascade Alliance and St. Vincent de Paul Society of Lane Co., some products from our in-house design brand, ENVIA, will be featured. To the left are some of the latest items that were created that will be showcased at the conference. We are pleased to introduce our newest team member, Communications Coordinator Kylie Nelson. 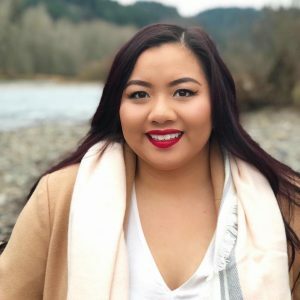 We are excited to have her on board, and know that her marketing background will help us do a better job of telling all the great Cascade Alliance stories being generated in this intrepid but far-flung network. We were pleased to present during the Recycling Markets session. Susan Palmer, Terry McDonald, and Mitra Chester shared on Equipment and innovation to tackle mattresses, textiles, styrofoam and glass. We are looking for an enthusiastic team member to join our team! Click here to check out our social media/program assistant opening. St. Vincent de Paul of Lane County was honored to receive the Recycler of the Year Innovation Award from the Association of Oregon Recyclers. 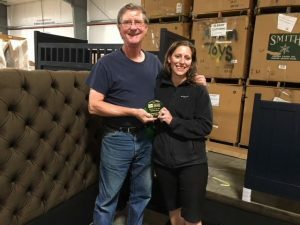 Executive Director Terry McDonald and mentoring leader Bethany Cartledge hold the award in one of our warehouses where we fix damaged materials for reuse and upcycling. Guess who was hired to make the award? Our very own Aurora Glass! Cascade Alliance has been featured by Next City and Non-Profit Quarterly! “There is great untapped potential to employ more people in these jobs as more communities and companies adopt zero-waste goals that will make more materials available for reuse, upcycling and recycling,” Cascade Alliance Director Susan Palmer writes. A new collaborative fund, led by the Neighborhood Funders Group has attracted some great foundations — Surdna, Ford, Open Society — in an effort to move more resources to equitable and sustainable community development. At St. Vinnie’s and the Cascade Alliance, we are on a similar trajectory, providing nonprofits the social enterprise tools they need to be strong in their communities. And our Cascade Alliance members are now sharing their expertise across the network. 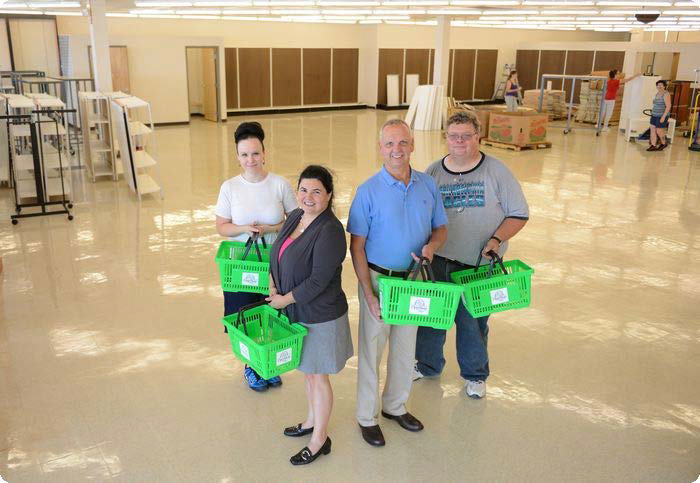 Great article by Indy Week featuring The Scrap Exchange’s new thrift! We are proud to be partners with this innovative nonprofit. 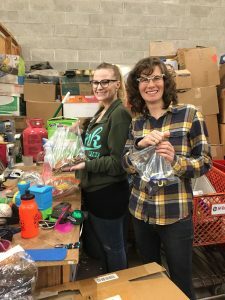 “Scrap Thrift was the result of a recommendation from the Cascade Alliance, a group that helps nonprofits turn discarded items into income and jobs. Congratulations to our St. Vincent de Paul executive director, Terry McDonald, who was bestowed the “Inspirer of Peace” award by the Nobel Peace Laureate Project earlier this month. He was recognized for his work to peacefully educate our community. 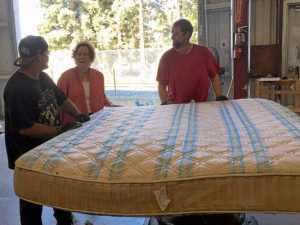 This week, several national recycling news outlets published stories highlighting Cascade Alliance’s work in mattress recycling! Recycling Today, Waste Today Magazine and Recycling International are among those who wrote about the state of mattress recycling in the U.S. and the great work we are all doing! Below is a running list of the stories. Feel free to take a look and share on social media. costs since the law took effect in the state. businesses and institutions with collecting and transporting mattresses to recyclers. jobs for people who face barriers to work. manufacturers and retailers are initiating their own recycling programs. municipalities and private waste haulers generally charge extra for disposing of a mattress. Mattress owners have even illegally dumped mattresses to avoid this cost. 10,000 tons of materials processed for recycling and composting, five to 10 jobs are created. higher. For every 10,000 tons of mattresses diverted, 40 to 50 jobs are created. recycling and reuse programs like Cascade Alliance. by the Robert Wood Johnson Foundation. Cascade Alliance member, The Scrap Exchange (Durham, NC), is planning for the development of a community Reuse Arts District – a destination with makerspace and shops, art studios, galleries and artist marketplaces, gardens, a sculpture park, architectural salvage operations, affordable housing, a shipping container mall, and more. As part of that process, we are helping The Scrap Exchange open an 18,000-sq.ft. retail thrift store to serve as an anchor tenant for the shopping center! Read about Executive Director Ann Woodward’s vision here. Susan Palmer, Cascade Alliance director, and Terry McDonald, SVDP executive director, had the pleasure this past week to witness first hand the success of several Cascade Alliance members’ social enterprises. 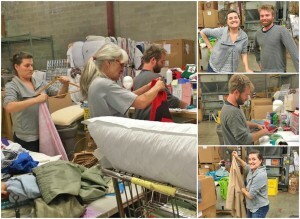 Finger Lakes Reuse (pictured left), located in Ithaca, NY, is growing its reuse thrift stores – looking for more opportunities to help the planet and people. Opportunity House, located in Reading, PA, has improved its thrift store displays and is enjoying growing sales. Greater Bridgeport Community Enterprises, located in Bridgeport, CT, just received funding to upgrade its mattress recycling equipment, so the enterprise can increase revenues. Our member groups inspire and motivate us! “In the realm of materials management—transforming stuff that has no value in its current form or location to stuff that does have value—requires collaboration to get from problem to solution.” Learn our four strategies for scale from a local mattress recycling effort that is going beyond waste reduction and expanding across the United States: The Princess and the Pain Point. 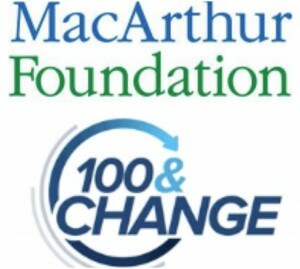 SVDP, Cascade Alliance’s parent organization, was in the running for the MacArthur Foundation’s “100&Change” grant. Though SVDP didn’t win, the judges were impressed with our proposal for a global Cascade Alliance: The solution offered is innovative and sensible, and I very much like the vision of a global recycling network to manage ‘stuff’ that also provides employment to groups of workers who often have difficulty in the labor market. 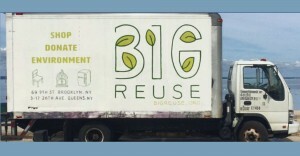 Cascade Alliance is thrilled to announce its newest member, New York City-based Big Reuse. Construction and demolition waste accounts for 60% of all solid waste in NYC. By salvaging and marketing usable items from demolition and remodel projects, Big Reuse is creating jobs & eliminating waste. Connecticut’s mattress recycling exceeds goals! (11.7.16) Thanks to Cascade Alliance member Greater Bridgeport Community Enterprises‘s hard work and diligence, Connecticut’s mattress stewardship program finished its first year beating the forecast! State officials gushed. 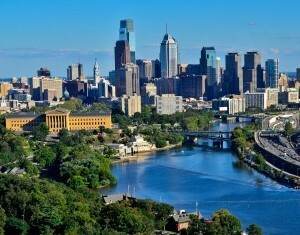 “This program has created jobs, recovered vast quantities of resources to be reused, saved municipalities $1.5 million in disposal costs and given residents an easy way to recycle a cumbersome item,” said Robert Klee, commissioner of Connecticut’s Department of Energy and Environmental Protection. Read more here. This year’s biennual ReuseConex conference in Boston was a great event! 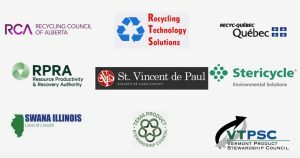 We and other Cascade Alliance members shared our expertise in the reuse economy and learned from others who are doing amazing work promoting reuse. Terry McDonald, SVDP Executive Director, spoke about the success of Envia, SVDP’s line of upcycling fashion products. We’re looking forward to ReuseConex in 2018! 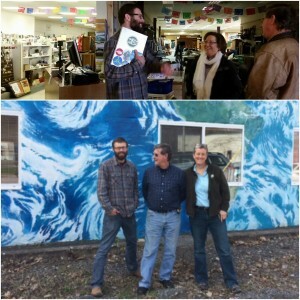 Jeff and Jessie, managers at Cascade Alliance member The Scrap Exchange, a creative reuse arts center in Durham, NC, received hands-on training in retail thrift from experts at St. Vinnie’s in Eugene, Oregon. 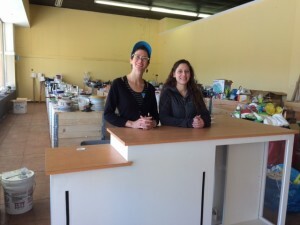 The Scrap Exchange is expanding from arts reuse into full-fledged retail thrift. Click here to learn more about Scrap’s plans for the creation of a Reuse Arts District and the National Center for Creative Reuse. Three Cascade Alliance members held popups this summer and made an additional $10,000 total to help fund their missions. 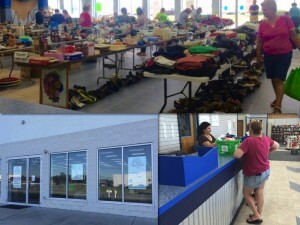 Finger Lake Reuse, The Scrap Exchange and the Opportunity House (pictured left), with expert guidance from Cascade Alliance staff, took advantage of the warm summer days and surplus of donations to hold popup shop sales in their communities. Congratulations on taking the plunge! 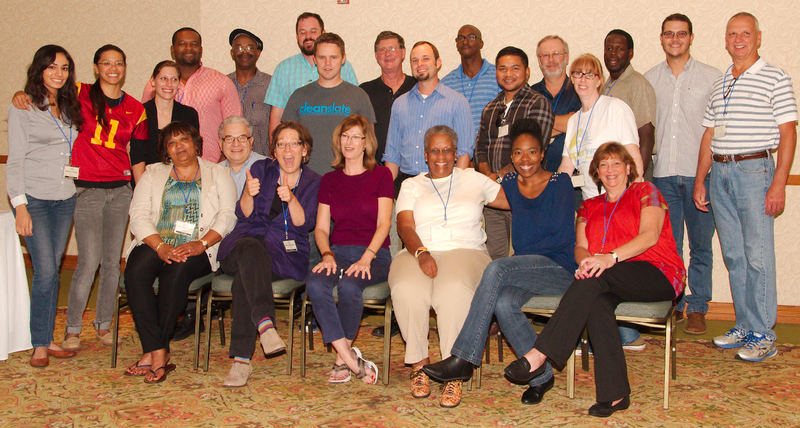 The Cascade Alliance gathered in Philadelphia for a weekend of sharing ideas, problem solving and fun! We kicked off our 3rd annual Work the Problem conference with a tour of member Opportunity House‘s remarkable social service center and retail thrift store, the OppShop. Over the next two days, we discussed ideas, lessons learned and best practices in reuse and recycling social enterprises. We heard from Madeline and Rebecca of the Scrap Exchange, Gregg of UTEC, Inc., Diane and Chris of Finger Lakes ReUse, and Leisha and Terry of St. Vincent de Paul Society of Lane County. The weekend was a great success and we all returned to our businesses with fresh ideas, new friends and renewed enthusiasm! 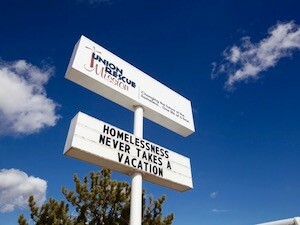 A big welcome to the Union Rescue Mission, our newest Cascade Alliance member in the Midwest! We are looking forward to working with URM to establish a social enterprise that provides quality jobs for people with barriers to employment, revenue for URM’s mission and a second life for discarded materials. The Scrap Exchange, Durham, NC, held its second-ever popup February 6-7 and earned a record $12,578. Cascade Alliance staff was on hand to help with the fast paced sales. Looking forward to your next popup in May 2016! 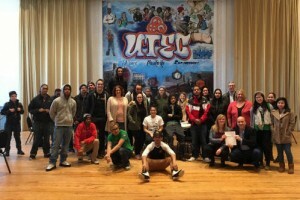 UTEC, a nonprofit in Lowell, MA, helps gang-involved and disconnected youth find a new path through job training at their mattress recycling facility. The phones are ringing off the hook at DR3 Recycling, a Cascade Alliance member, which was awarded two state contracts to provide recycling services under California’s new mattress recycling law. The law went into effect on December 30, 2015 and DR3 has been fielding calls from consumers, businesses, and retailers wanting to recycle their mattresses that just a few days ago would have likely gone to the landfill. We are so happy to see the enthusiasm for DR3 and mattress recycling! 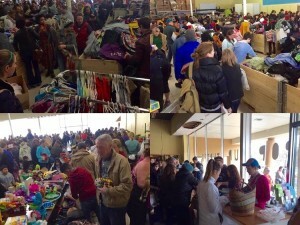 Cascade Alliance member Finger Lakes ReUse has opened a new 17,000 square-foot store in Ithaca, NY. 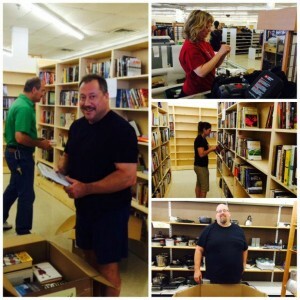 This is the nonprofit’s second retail thrift. They opened their first store in 2008. The ReUse Center’s mission is to extract value from local material resources and translate them into opportunities. Congratulations!! Cascade Alliance Director, Sue Palmer, recently visited our member UTEC (Lowell, MA). 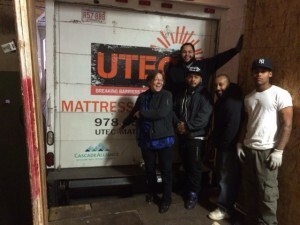 UTEC’s mattress recycling program provides work opportunities for at risk youth seeking social and economic success. Great work, UTEC! A wonderful video showing what Cascade Alliance member The Mustard Seed of Central Florida furniture and clothing bank offers its community. And the great feeling they get in return. It feels good to do good! Cascade Alliance member, The Scrap Exchange, held its first pop-up shop over the weekend in Durham, NC. People were lined up 30 minutes before the opening and the sales were through the roof! Cascade Alliance staff was on hand to help set up the store and work the sale! From other people’s discards, The Scrap Exchange made $10,000 to support its programs. That’s a good day! 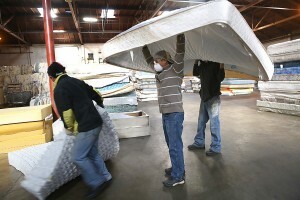 Cascade Alliance member DR3 operates two mattress recycling facilities in California. They are fired up and ready for the January 1, 2016 start of California’s new mattress stewardship law that will divert in 400,000 mattress a year from landfills. Read more in Woodland, CA’s Daily Democrat. 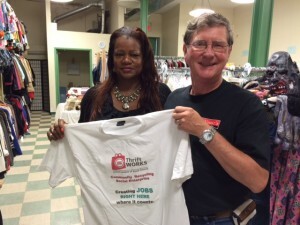 Cheryl Howard, Director of Social Enterprises for Cascade Alliance member Urban League of Essex County (Newark, NJ), and Terry McDonald, Executive Director of SVdP (Eugene, Oregon) meet in Urban League’s ThriftWork’s pop up shop in Newark!! Cascade Alliance member UTEC has put new words behind its acronym, updated its logo and changed the tagline to better reflect their expanded mission. UTEC now stands for United To Empower Change and the new tag line reflects its core mission: Breaking Barriers to Youth Success. Read more about the changes in The Sun News. Some love for Cascade Alliance member, the Scrap Exchange in Durham, NC. Shout out to Cascade Alliance member United Teen Equality Center (UTEC) in Lowell, MA. 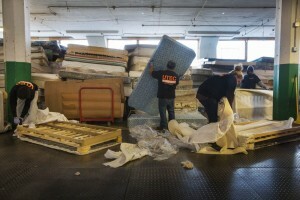 UTEC’s mattress recycling operation was featured in a Boston Globe article on the state’s efforts to recycle many of the estimated 600,000 mattresses that state residents trash every year. “We think it’s the right thing to do for the environment, while providing meaningful jobs to our young people,” said Gregg Croteau, executive director of UTEC. Read more about the state of Massachusetts mattress recycling plans and how UTEC is playing an important role! Congrats UTEC! 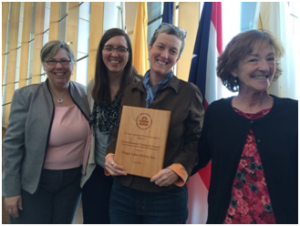 Finger Lakes ReUse Wins EPA’s Highest Award! Cascade Alliance member, Finger Lakes ReUse won EPA’s 2015 Environmental Champion Award in recognition of its accomplishments in transforming waste into jobs and job skills training opportunities for the community. 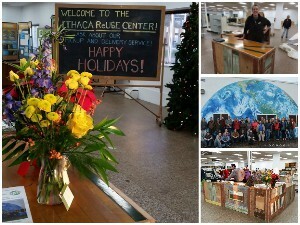 The Ithaca, NY-based nonprofit Finger Lakes ReUse is dedicated to helping communities benefit from reuse by reducing waste, relieving poverty, and teaching job skills. Congratulations! Watch news coverage of the opening day of Cascade Alliance member the Opportunity House’s first retail thrift store. 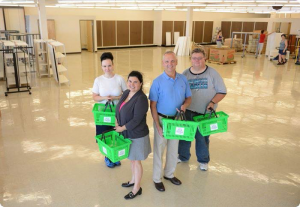 See how the OppShop is improving lives and providing employment for people with barriers in Reading, PA. We’re so happy to be part of this journey with our friends at the Opportunity House! The countdown has begun. . . 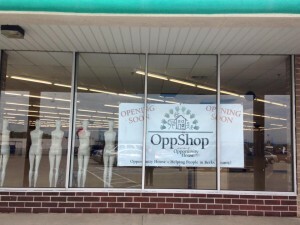 In just 2 weeks, Cascade Alliance member Opportunity House will open the doors of its first retail thrift store–The OppShop! Retail thrift experts from SVdP are in Reading, PA to help them fill the shelves, train staff, and ensure a smooth opening. Proceeds from the OppShop will enable The Opportunity House to assist more children, families and adults who face obstacles to independent living. Great work everyone! Dave Tussing, SVdP special projects manager, spent time in Orlando, Florida this week helping Cascade Alliance member The Mustard Seed streamline their mattress recycling and retail thrift operations. 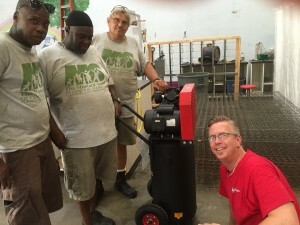 In this picture, Dave and Mustard Seed mattress recyclers are admiring their new air compressor (provided by the Cascade Alliance), which they’ll use to clean their equipment–resulting in fewer equipment breakdowns and more efficiency. We’re glad to be helping such a worthy organization! The Scrap Exchange (Durham, NC) has increased its revenue after implementing retail lessons learned as a member of the Cascade Alliance. 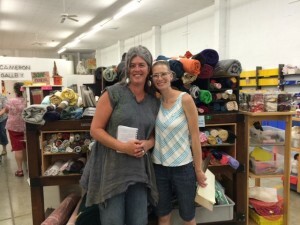 On a visit to The Scrap Exchange, Sue Palmer, Cascade Alliance director, snapped this picture of Ann Woodward, SE executive director, and Madeline James, SE store manager, standing in front of their new, more prominent display of fabric scraps that has boosted sales. So happy to be helping The Scrap Exchange prosper! Cascade Alliance member Opportunity House is opening its first retail thrift store in Reading, PA this summer in the Penn Plaza Shopping Center. We are excited about this new venture for OppHouse and the Reading community! 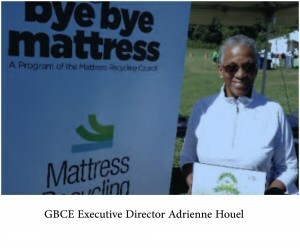 Cascade Alliance member Greater Bridgeport Community Enterprises was one of two businesses selected by the state of Connecticut to recycle mattress under the state’s new mattress recycling law, which began on May 1, 2015. Their operation, called Park City Green, was featured on the local NPR affiliate! Twenty people representing 10 Cascade Alliance member groups gathered in Eugene, OR last weekend to Work the Problem! 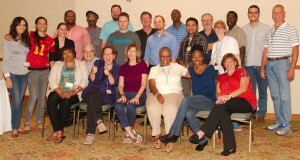 With SVdP staff in attendance, members shared their stories of successes and challenges. The agenda included presentations by SVdP staff about commodities markets, opening a pop-up shop and worker safety, plus break out sessions, workshops and behind-the-scene tours of SVdP operations! We all worked together to learn from each other and grow our waste-based businesses to protect the environment fund our social service programs! For more information about becoming a Cascade Alliance member, click here. 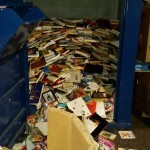 Problem: The Up Center in Norfolk, VA had excess books and book collection bins, while the Opportunity House in Reading, PA needed books and a way to collect them. Solution: Through the Cascade Alliance, each organization became aware of the other’s needs and stepped up to help! 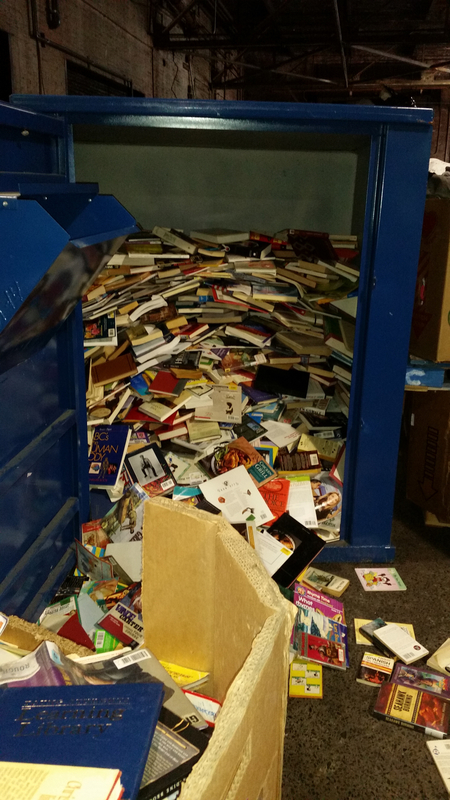 Just this week, the Opportunity House received from The Up Center 5 large book donation bins filled with books to be placed around Reading (once emptied, of course!). The Robert Wood Johnson Foundation just released “Waste-Based Social Enterprise Supports Job Training, Jobs, and Services” describing the key results and lessons learned midway through their funding of the Cascade Alliance. Congratulations team! Cascade Alliance member, Greater Bridgeport Community Enterprises, opened its first one day pop-up shop selling used books and crafts made by local artisans. Congratulations GBCE! Watch out for their next pop-up shop on May 23rd. 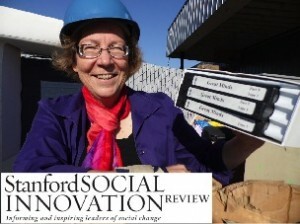 We would like to thank REDF for collaborating with SVdP and the Robert Wood Johnson Foundation in starting a mattress recycling facility in Northern California to create jobs. REDF is a California nonprofit that creates jobs and employment opportunities for people facing the greatest barriers to work. We are holding our next conference for Cascade Alliance members May 14-16, 2015. Stay tuned for registration info. If you would like to learn more about becoming a member go here. Cascade Alliance and St Vincent de Paul of Lane County attended the Santa Fe Art Festival Dec 5-7. 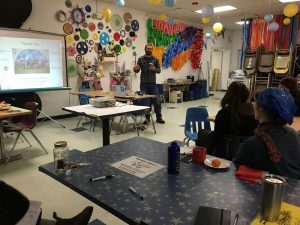 It was an opportunity to connect the Southwest with Cascade Alliance Upcycling and recycling projects. The show was a hit and we sold 313 items! 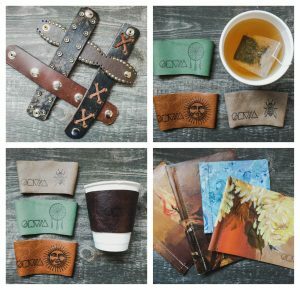 For every upcycled product we sell, we are keeping materials out of the landfill, creating revenue for our social programs and creating real jobs! Cascade Alliance and St Vincent de Paul of Lane County (SVdP) attended the 2014 ReuseConex Conference in Austin Texas Oct 23-25. SVdP’s Executive Director Terry McDonald was a distinguished speaker at the conference, and we distributed information regarding waste based business and displayed examples of upcycled fashion products created from recycled materials. 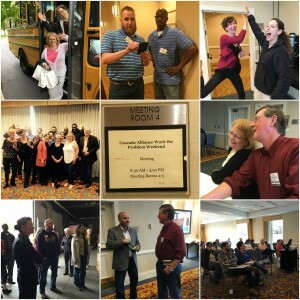 Cascade Alliance held our first annual conference Sep 18-20 in Eugene, Oregon. Attendees included nonprofits from across the country. The agenda included distinguished speakers, break out sessions, workshops and tours highlighting local business. If you’re interested in joining the Alliance, please fill out a brief questionnaire. The Mattress Recycling Council, formed by International Sleep Products Association has released an educational video prmoting mattresses recycling for retailers in Conecticutt, California and Rhode Island. You can find Bed Times article HERE, and links to the videos HERE. Philanthropy.com recently featured an interview with Risa Lavizzo-Mourey to discuss how the Robert Wood Johnson Foundation is adjusting to shifts in U.S. public health issues. You can read the interview HERE.